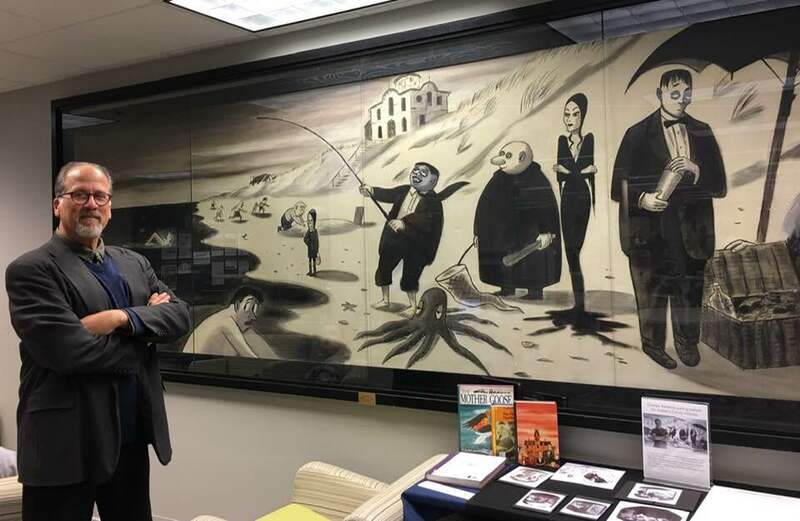 I spent most of the fall of 2017 as a Visiting Professor of Integrated Studies (whatever THAT means) at Penn State University where I discovered a neglected mural by Charles Addams. Hard to neglect a mural that is 14' long, but it had been relegated to the side basement entrance of the library behind a security desk and behind plate glass that perfectly reflected all of the ceiling fixtures in such a way as to virtually obscure the painting. Subsequently it has been suggested to me that the mural was going to go into "cold storage" (maybe sold?) during the library renovation...but that my piece in the New Yorker kept it relocated on campus in a much more favorable and student-friendly environment...in the periodicals room.